Great little SUV, packs more than appears. I am absurdly happy with my car. For my job I am often driving on gravel roads and rough terrain and this vehicle always handles it incredibly well. I was originally concerned about it not being 4WD but the all wheel drive has not let me down yet, even in some extremely icy conditions. This car can fit a lot of cargo, more than I ever expected it to. For an SUV it looks a little on the small side but it is deceiving that way. The only downside for storage is that when you fold down the back seats they do not fall level with the trunk, but it is not the worst thing in the world. I find it gets surprisingly good gas mileage for being an SUV (around 29 mpg on the highway), and it handles really well. Decent turn radius, engine is not too weak for being a v4. It is a little on the loud side, but not deafeningly so. When I had to purchase a vehicle I was looking for it to do 3 things for me: first was be able to drive gravel roads, second was to let me pack up most of my life into it, and third was that if I hit a deer I would walk away no problem. My car has checked off all 3 of those wishes for me. Couldn't be happier. 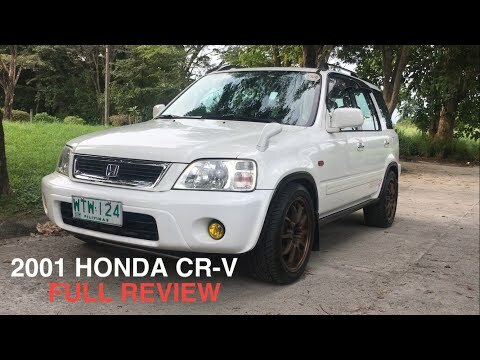 Honda CR-V! A great family SUV, durable interior, exterior, and engine. I love my Honda cr-v. I have not had any issues with it. Change the tires, oil and battery is the only maintenance it has required. If there were anything I would recommend is more acceleration power, an arm on driver seat. . . That is it. Interior is cloth and after 17 years, it still does not show wear or tear. The engine is still running strong with 170,000 miles on it. I have not had to replace any of the components in the engine. It is just a great little SUV. . . Would recommend anyone looking at a small SUV to buy Honda. I bought my car used, so it has inevitably had small issues here and there, though nothing extreme. It has been a pretty reliable car for the past 4 1/2 years. From the outside, its size is deceptive as, when putting down my back seats, I have been able to haul a number of large things home, including a treadmill, inversion table and 6' tall bookcase (not at the same time, of course). It is great on gas, and is the perfect size for my son and me. I am in the market for a new car, and would definitely buy another Honda CR-V.